It has become one of the most familiar sights in kitchen cupboards across the world. Yet Lyle's Golden Syrup actually began life as a by-product from refining sugar cane. However, Abram Lyle soon realised that the treacly substance could be turned into a delicious preserve and sweetener for cooking - and now the syrup, which was canned for the first time at Plaistow Wharf in London's Docklands, is celebrating its 125th anniversary. Despite being more than a century old, not much has changed over the years, including the contents, the packaging and branding of Lyle's Golden Syrup. However, over the next 12 months, it will undergo its first change, in celebration of its 125 years. The iconic Victorian-style tins, which were established the same year as the first electric railway and has survived two World Wars, are getting a makeover. For the entire year of the anniversary, alongside its usual green tins, Lyle's Golden Syrup will also be available in gold tins. The brand already made history in 2006 when it was recognised by Guinness World Records as having the world's oldest branding and packaging. The syrup's trademark, "out of the strong came forth sweetness" and image of a dead lion and bees, is taken from the Bible, influenced by Abram Lyle's strong religious beliefs. In the Old Testament, Samson killed an attacking lion, and later noticed a swarm of bees had formed honey in the carcass. He later turned this into a riddle: "Out of the eater came forth meat and out of the strong came forth sweetness". The syrup started when Abram Lyle, a Scottish businessman, sent his five sons from Greenock to London to build a sugar refinery. The refinery at Plaistow Wharf ceased trading in sugar in 1967 but continued producing the syrup. In 1921, Mr Lyle merged his company Abram Lyle & Sons with Henry Tate & Sons to become Tate & Lyle, which is now the only cane sugar refiner in the UK. 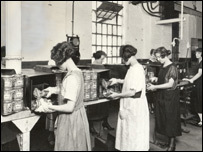 More than a century later the Plaistow Wharf factory remains the sole producer of the product under Tate & Lyle, producing about one million tins of syrup a month. Although founded in the UK, Tate & Lyle's roots can be traced back to several companies established in the middle of the 19th century focused on sugars in Europe and corn milling in the US and Europe. About 42 of Tate & Lyle's 1,000 employees are based at the Plaistow factory. The remainder are based at the company's nearby Thames Refinery. 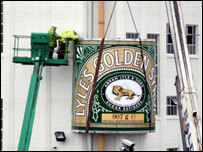 Factory site manager, Ian Clark, who collects Lyle's Golden Syrup brand memorabilia, says: "The factory has a long, long history and Tate & Lyle has always been seen to be an excellent employer. "The fact that we've had generations of families work here at the factory for years and years is proof of this." Tate & Lyle, now a global company, has a long history of supporting the communities in which it operates in Europe, the Americas, and South East Asia, which all began with the philanthropic approach of its co-founders. Lyle's Golden Syrup is older than the first petrol motorcar (1885), Coca-Cola (1886), Marmite (1902), and Cadbury's Dairy Milk (1905). The company's charitable spend allocations are the areas of education, the environment, health and the arts. Last year more than 3,000 primary school children visited the Thames Refinery for its annual child safety awareness programme run by the Metropolitan Police. Each year the two London factories also take in 40 work experience students between them and also work closely with school children on the National Curriculum. 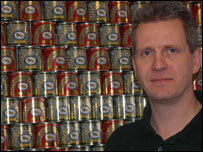 Mr Clark said: "It's in our interest to support the local community. If we help to raise the academic level of the people in the area then in turn the company will benefit from this." And how does this century-old factory keep up with modern times? "In the factory, we have new equipment, alongside old, to meet the requirements of the day," explained Mr Clark. "All new equipment is designed and built with flexibility in mind. We have to think about what we may need it for as there are always lots of changes taking place."